Catching the common cold or flu is very common in winter. Each year when fall comes, hundreds of people get affected by the influenza virus. In January 2018, Pakistan faced an outbreak of the flu which claimed a lot of lives. 35 people died because of the viral infection just in the course of a month. 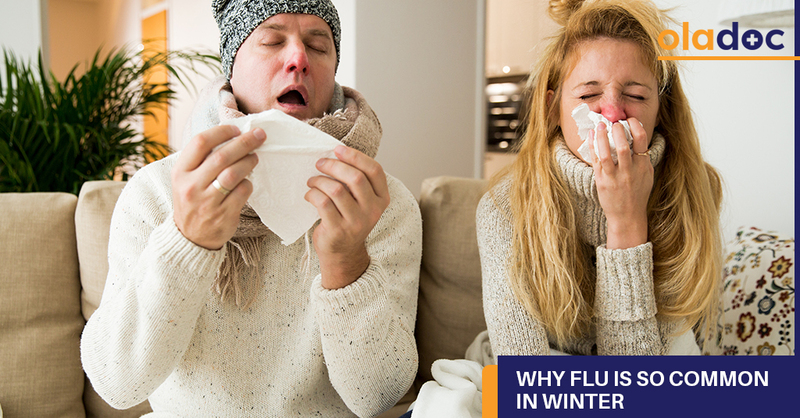 Although flu is caused by a virus and is not a direct consequence of the cold weather people are still more likely to catch it during winters. Have you ever wondered why? Here are three possible causes for propagation of flu in cold weather and how you can avoid them or else you would have to book a doctor online! Immunity is the ability of the body to protect itself from foreign, disease causing agents. To maintain a healthy body it is important to maintain a healthy immune system. A compromised immune system means that the body is vulnerable to all the diseases. For a long time, it was believed that the reason for increased sickness in winters was a compromised immune system. There was no scientific proof for this belief and people considered it a myth until recently when a study, proved that cold temperatures are likely to weaken the immune system. According to this study, during winter the temperature inside the nose drops. The low temperature inside the nose makes up for a favorable environment for the influenza virus to grow. The study also goes on to say that the immune cells are also unlikely to self-destruct to stop the spread of virus. Lack of vitamin D because of insufficient sunlight in winter is also linked to a depressed immune system. One way to avoid flu this fall is to boost your immune system. A diet rich in vitamins and minerals, and fluids can work wonders in this regard. Sufficient sleep is also likely to help. Another reason that a lot of people catch the flu in winters is proximity. People usually spend more time indoors in cold weather. Time spent indoors usually means close interactions with people who might already be suffering. Breathing the same air as sick people in a close proximity considerably increases the chance of catching the flu. A good strategy to avoid viral transmission is to minimize physical contact with sick people. It is also a good practice to eat and drink in separate utensils at least for the first three days of the infection. In winter, the wind is dry and the weather is cold. These conditions have been identified by scientists, as ideal for the influenza virus growth. The virus not only grows in these conditions, it also has a longer life span. A study conducted by a researcher from New York has revealed that the spread of virus is also encouraged by the cold weather. Tiny droplets are released into the air when we sneeze or cough. These droplets stay in the air as long as they are not heavy enough to drop down. During winter, the air is dry which means that the droplets remain in the air for a longer time. The more time these droplets spend in the air, more are the chances that they will be inhaled by other people. To avoid inhaling influenza through others’ coughs and sneezes, it is best to wear a mask in flu season. The flu season is usually January to March in Pakistan. If you or a loved one is experiencing flu, you should visit an ENT specialist as soon as possible. You can visit our website oladoc.com to look for top ENT specialists in Karachi, Lahore and Islamabad. You can also call our helpline at 042-3890-0939 to get directed to the specialists that are suitable for your specific concerns. « Top 5 Health Hazards of Smog and How to Avoid Those?